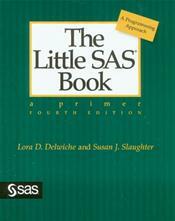 Now in its fourth edition, The Little SAS Book is a classic, helping many people learn SAS programming. The book's friendly, easy-to-read style gently introduces readers to the most commonly used features of the SAS language. Topics include basic SAS concepts such as the DATA and PROC steps, inputting data, modifying and combining data sets, summarizing data, producing reports, and debugging SAS programs. Each topic is presented in a self-contained two-page layout complete with examples and graphics. This clear and concise format enables new users to get up and running quickly, while the examples allow readers to type in the program and see it work! New topics in the fourth edition include ODS Graphics for statistical procedures, PROC SGPLOT for graphics, creating new variables in PROC REPORT with a COMPUTE block, WHERE= data set option, SORTSEQ=LINGUISTIC option in PROC SORT, and more functions, including ANYALPHA, CAT, PROPCASE, and YRDIF.